Favorite Time of year to go to Disney – Each time of year holds its own magic but Christmas is my favorite time of year to visit Disney World. I am a proud wife to my husband of 7 years and Momma Mouse to two young boys under 4. I run on Diet Coke, coffee and Pixie Dust and I love making memories with my family. 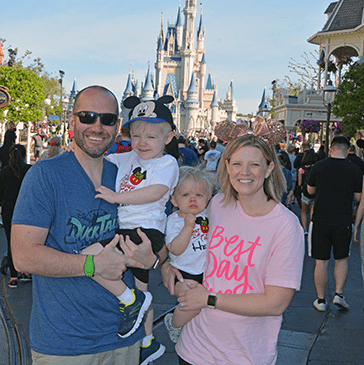 I have loved all things Disney for as long as I can remember and that obsession only grew after my first family trip to Walt Disney World when I was a senior in high school. Since then I have visited the parks as often as I can. I have traveled to Walt Disney World with large groups, small groups, for our honeymoon, for girls’ trips and with groups ranging in ages from 13 months to 67 years old. My favorite Disney memories are getting engaged in front of Cinderella Castle during the Wishes fireworks and walking down Main Street U.S.A with my boys this past spring on their very first trip. I believe there is nothing more magical than experiencing Walt Disney World at Christmas and I love eating my way around Epcot especially during the International Flower & Garden Festival. Helping others plan their Disney trips is a dream come true for me and I am truly honored when clients choose to work with me to plan their vacations. It is my goal to take the stress out of planning so you can focus on the Magic and I can’t wait to help make all of your Disney vacation dreams come true!